Now that kitchen shelving is getting more popular, I also seem to be doing more of it! It adds such warmth and personality to spaces. It is a great look to mix both decorative AND useful items on shelving, that's really the beauty of it. Books, and salt/pepper shakers. Dishes and antique bowls. Vases and oil/vinegar botlles. Of course, closed baskets also look great on shelves, adding texture, but not dust! I've lived with open shelving for my dishes and glasses now for a few years, and I have to say we love it. The dishes and glasses are used so frequently that there isn't time to accummulate dust. Some glasses which are less used, we'll do a quick rinse under the nearby faucet, and that's it. Open shelving is not for everyone, granted. I just ordered 14 brackets for a project. The place I mostly go to is Iron Accents. It's a Yahoo store, a very reliable company, and I've used them for years, I can definitely vouch for their product and quality. They also have a million different finishes, including colors! Some items are traditional in style, some are modern, and many are inspired by nature. If you use your imagination, you'll see how adaptable they are to many different design themes. For the project I just purchased these brackets for, I wanted something very simple, especially having 14 of them. Simple, yet interesting, with a hand made sort of look. For me, it's a great go-to source. 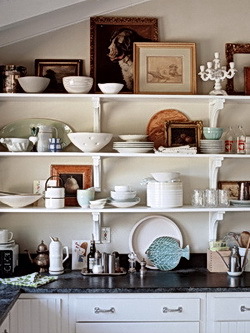 Beautiful shelving image found in the beautiful collections of Desire To Inspire!